Today’s post is another installment in the series of books Natalie loved as a child, which really is just the series of books Natalie still loves because I am a nostalgic being and have largely the same taste in books. Little Natalie made great book choices. Christian is gaga for Princess Marigold. But he’s just a commoner, and no match for royalty. Heck, he lives in a cave with a troll! And now he’s discovered another reason to put his love-soggy heart on ice: Queen Olympia is scheming to take over the kingdom–and she’ll bump off her own daughter to do it. Can Christian foil her diabolical plans? To be honest, the City of Ember probably would also be my favorite childhood read (but I’ve already talked about it and I’d obviously never talk about the same thing twice.) As I thought about other books I loved, I remembered this little gem. I specifically remember the first time I read this book. It was a Friday afternoon, and I had brought the book home from my school’s library as a weekend read. My mother was repainting our living room walls, but that didn’t stop me from sitting in the room in one of our big leather chairs to start reading the book. In fact, I finished it that same afternoon. And read it a couple more times before Monday. Obviously, I adored this book. 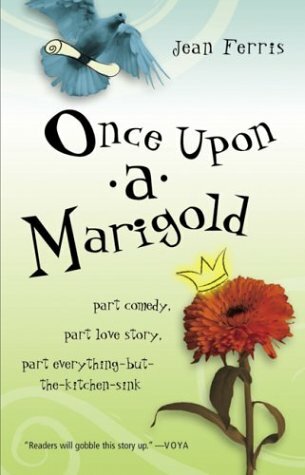 A few weeks ago, I reread Once Upon a Marigold for the first time in years, and it was still as delightful as the first time. It’s such a lovely children’s book–clever without being condescending, charming without being cheesy (well, at least not overly cheesy). The main characters, Christian and Marigold, are kind and lonely and so relateable, really. (As I, too, have no friends and make terrible jokes.) All the side characters, like Ed and King Swiftbert, are just hecka funny and make the book a hilarious time. The love story is sweet, the message heartwarming. What is not to love about this book? Nothing, I tell you. It’s got everything, except, according to the cover, the kitchen sink, which I am able to overlook.